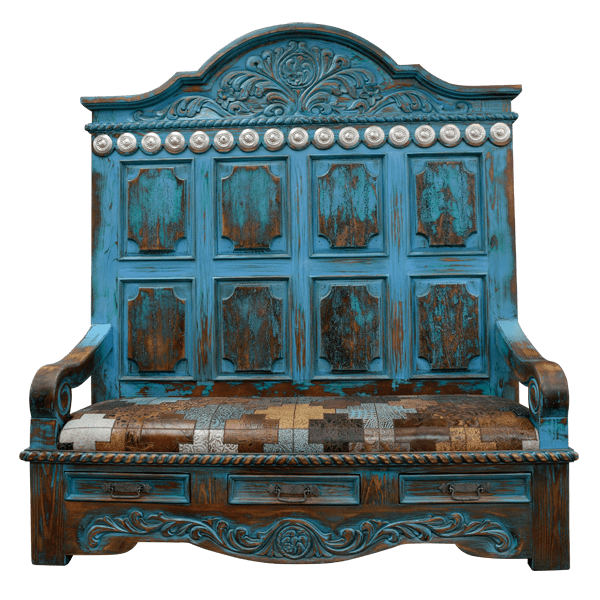 Adorn you home décor with the exquisite, Baroque details of this handcrafted, Spanish colonial style bench. The bench´s seat is upholstered with a mosaic design of contrasting pieces of full grain leather, and the leather is double stitched together for extra strength and durability. 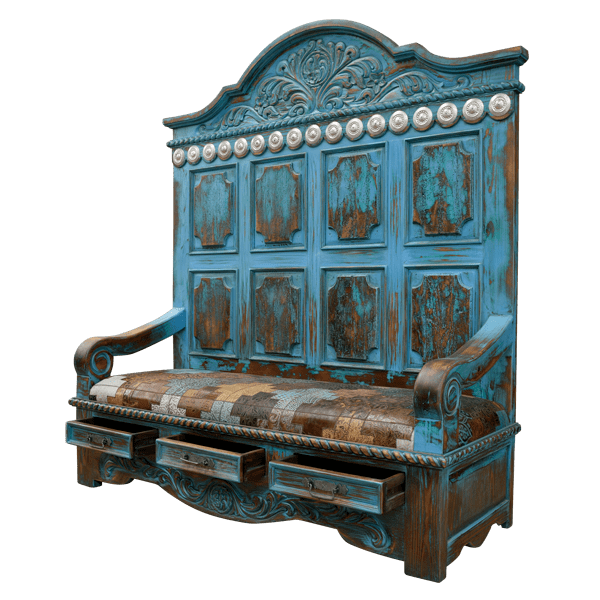 Embellishing the top of the bench is a solid wood crest with magnificent, hand carved, floral and scroll designs. Following the floral designs is a graceful, hand carved twist rope design, with silver finished, hand forged, iron conchos below. 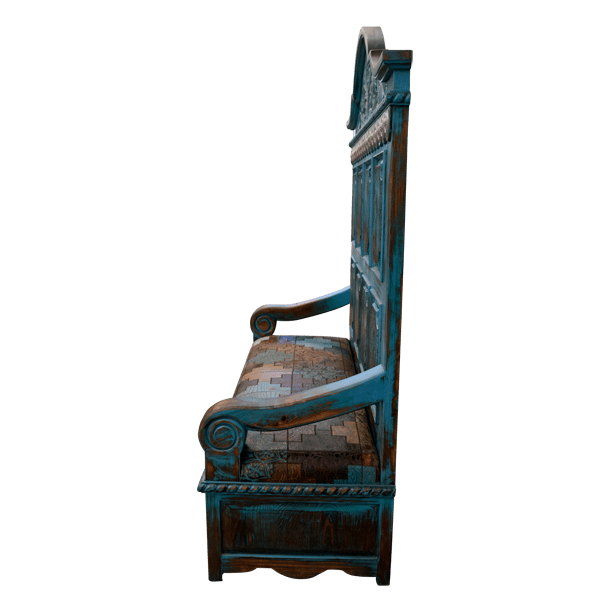 The face of the seatback is adorned with eight, geometric cut panels, and each panel has a large, hand forged, iron nail head in each corner. On each side of the seat are curved, colonial style armrest. Below the seat is a hand carved, twist rope design, followed by three, horizontal drawers. Each drawer has a hand forged, iron handle in its center. The bench ends with a curved apron, enhanced with lovely, hand carved, floral designs, and it rest on solid wood feet. 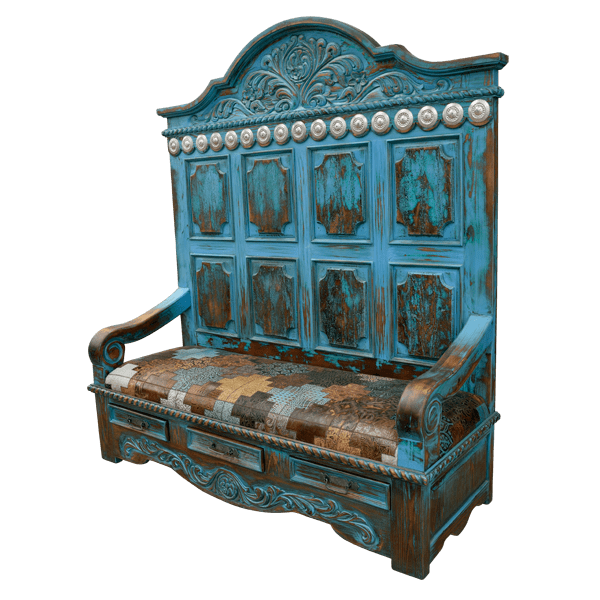 It has an antique, turquoise finish, and it is made with the best, sustainable, solid wood available. The bench can accompany our Zoila bed (Number 30), Zoila armoire (Number 22), Zoila dresser (Number 26), and our Zoila end table (Number 39). It is 100% customizable.